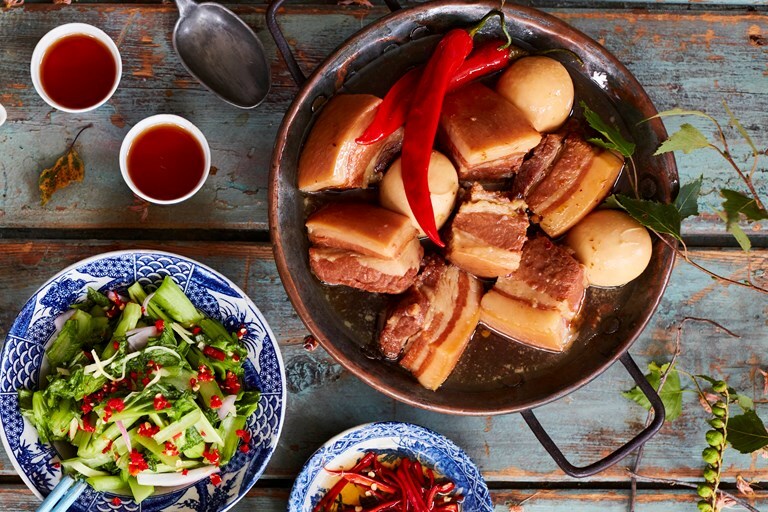 Thuy Pham's coconut-braised pork belly recipe is proper Vietnamese comfort food. The pork is marinated in chilli, shallot and garlic before cooking low and slow in coconut water until the pork belly is so tender it melts in the mouth. This recipe is taken from The Little Viet Kitchen by Thuy Diem Pham, published by Absolute Press. Photography © David Loftus. To my mind this is the ultimate home comfort food. It never fails to bring back fond memories of large family meals, generally for a special occasion like Tết (New Year) or a wedding celebration as pork was considered a luxury, so symbolises wealth and fortune. This is a beautiful and simple dish that showcases the key technique in Vietnamese cooking of slow braising in coconut water. Sweet, salty and spicy, it is best accompanied with sour and bitter pickles and is perfectly balanced by serving with fluffy jasmine rice. Slow cooked in the natural sweetness of coconut water, the pork is so juicy and tender that every bite melts in your mouth. Perhaps it is because we had this dish so rarely that even to this day I savour every mouthful like it’s my last.